Vacuum cleaners are major purchases, and like most other major purchases in life, there are lots of questions about which one is right for you. Before you bring home — or even start browsing for — a new vacuum, here are five things you should keep in mind. Part of what makes shopping for a vacuum so confusing is the sheer variety of product models and types that are on the market. Narrow down your search by figuring out which type of vacuum you’re seeking. If you’re not sure, start by focusing on the features you desire. Want to clean your house without constantly plugging and unplugging? A cordless model may be best. Looking for a device that is portable and capable of cleaning small spaces? Try a handheld device. Once you know what vacuum you want, you need to know when to buy it. 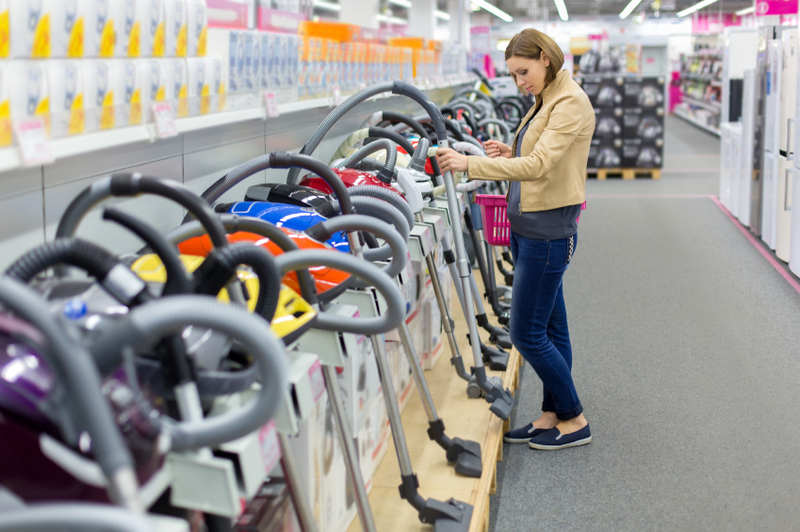 As with most consumer product purchases, there’s an ideal time to buy a vacuum cleaner. Plan to shop during April or May (spring cleaning sale season). Taking advantage of these seasonal discount events will help prevent you from paying full price for your new home cleaning assistant. For more helpful tips on how to score a vacuum at a sweet sale price, check out our guide to getting the best deal on a vacuum. Weight: Pay attention to how heavy your new device will be. Cord Length: If you pick a corded model, you’ll want to know whether you can reach across an entire room without unplugging. Battery: When choosing a cordless vacuum, pay attention to how long the device can operate on a single charge (as well as how long it takes to fully charge the battery). Bag: If you don’t want to regularly purchase replacement bags, consider a bagless vacuum variety. Vacuum cleaners aren’t always complete on their own. Accessories and add-ons should also play a role in your purchase decision. The popular Dyson Ball Compact Animal (formerly the DC50 Animal), for example, comes with a tangle-free turbine tool, combination tool and stair tool. Such bonus features make the device ideal for cleaning up pet hair. Look for these and similar tools to make your cleaning jobs easier. Keep in mind that some models include accessories, while others require that tools be purchased separately. Finally, don’t neglect to do your shopping research. Homework is never fun, but it’s a lot easier with the help of store-specific vacuum buying guides. Stores such as Lowe’s and Overstock offer these buying guides on their websites. So if you know you’ll be making your vacuum purchase from Best Buy, for example, head over to the retailer’s Vacuum Cleaner Buying Guide page. It lays out which types of models are available for purchase (along with a summary of their features) and takes you straight to those product categories on the retailer’s website. Ready to start vacuum shopping? Take a look at our Vacuum Buying Guide for a few more tips on what you should be looking for in this cleaning product.